The eyes of a Great-horned Owl are huge. While they appear globe-like, they are actually tubular. 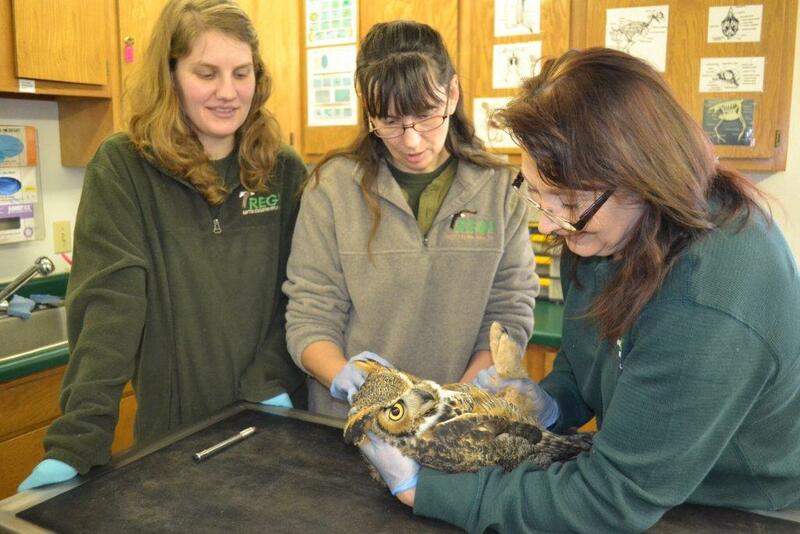 Avian Rhabilitator, Alberta Halfmann and Tristan Pesavento with the male GHO Tristan rescued. As with all owl releases, this one took place near dark. ﻿﻿﻿ Releases are always an exciting time. 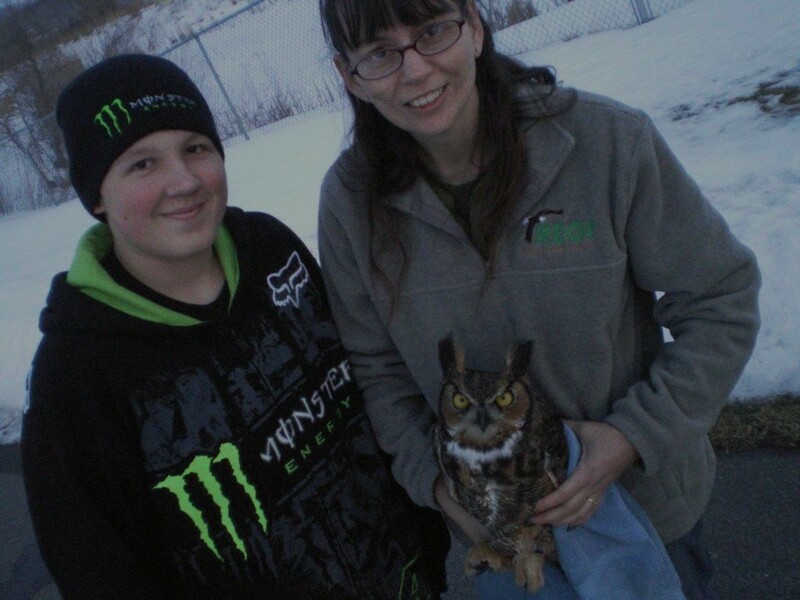 On Wednesday evening REGI staffer Alberta Halfmann did the honors of taking a Great-horned Owl ( GHO) back to his original territory for release. This patient, a male Great-horned Owl, injured his wing after being tangled in a fence near Wausau East High School, Wausau, WI. This release was all the sweeter because 14 yr old Tristan Pesavento, the person that actually rescued this GHO, was on hand to give him his freedom once more. Everyone was delighted with the release but no one was happier than the owl. He flew out of sight immediately and was last seen making a bee line for his nest tree. This is breeding season for Great-horned Owls in our area. It is important to get him "home" as soon as possible. No doubt he has important work to do. His mate may be on a nest. Super job Tristan! While we would not suggest someone Tristans age take on this kind of responsibility, the owl would not have lived long trapped in the fenceline. His quick thinking was important and we are so proud! Home sweet home for the male GHO. 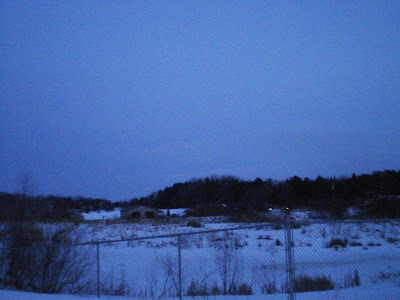 Owls are released near dark. As nocturnal predators, they can attract attention of crows, hawks and other birds if released when it is daylight. Our patients are conditioned in large flight buildings. The ceiling is 28' high. They are not close to us. It is vital that all birds when released are 100% when they leave REGI. Each patient receives an exit physical the day of release. With the bird "in hand" we can evaluate things that are not readily apparent as they exercise. In this way we are certain the bird is in perfect health and condition and can once again survive in the wild. We did 2 GHO physicals Wednesday, but only one was ready. 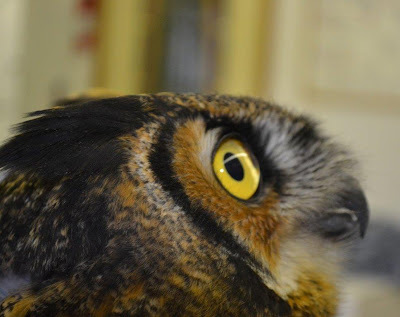 The other continues to recover from a head injury and was put back in the flights with two other GHO patients. This male GHO has a little longer to wait before he is released. Alberta Halfmann and Stacy Wild assit Marge with the exam. We received a call about an adult Bald Eagle on the ground. She had been electrocuted and died before we arrived. We collected her body for USFWS. Electrical shock injuries and wire hits are events we are required to report to USFWS as well as our State of WI DNR. Illegal electrical set ups could be involved, or malfunctioning functioning units on a high tension line. We see several electrocutions a year, however years ago there were many more. Studies by raptor biologists and Raptor Research Foundation helped tweek the electric pole designs over the past 30 years to prevent deaths of eagles and osprey. Birds wingspans and perching habits are now taken into consideration before new poles are installed. We hope they can find and repair this site before any more eagles are killed. 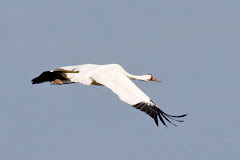 The following link will explain the changes and the way birds with large wingspan are affected by pole design. 007 is on a hiatus from his CA EDTA injections. Blood will be drawn today to check his blood lead levels. 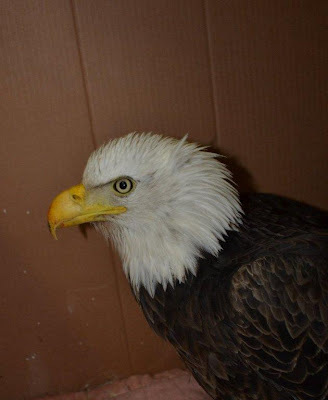 Our Bald Eagle patients of the past week are doing well. The 007 is on a break from his Ca EDTA injections. After a four day break we will do more blood work to determine his current blood lead and a new course in treatment will be started. It will be good to get these male eagles home again. They both have a long way to go, but positive thinking is helpful for all of us. We have checked out several calls for eagles down but sadly have been unable to locate them. Eagles like all wild animals camouflage well. That brilliant white head and tail disappear easily in a snowy landscape. We have several calls on Sandhill Cranes. Don and I are make an attempt to capture one of most critical ones this afternoon. I appreciate the many calls I have received concerning my red-tail Juliet. She is still with us. She has periods of better and then worse times. She is having a hard day today. I still have great hopes she will pull out of her illness this time. She is a strong and amazing bird...and has been a member of the REGI family for 23 years. We have come to think of her as invincible, I hope she proves us right. Thank you everyone for your thoughts and encouragement. My computer had a virus. The chaos created has been great. Just about the time we thought it was resolved, it was not. It is still being restored. We forget how much we rely on that little box on our desks until it is not functioning well. Many thanks to Matt Zack of Zacks Computer in Antigo https://www.facebook.com/pages/Zacks-Computers/148916375151505?v=info for helping a frantic me.